Is There Still Life in 65mm? There could be, if some contemporary filmmakers with true vision can be gotten to see a short test film shot last year using contemporary Eastman negative and print stocks. The project was initiated by an executive at Arri who wanted to remind film makers of what film quality could be and was shot by cinematographer Bill Bennett, ASC in Lone Pine and downtown LA under a variety of daylight and magic hour conditions. The original project involved shooting the same setups in 65mm, 35mm anamorphic, and Super 35 and a 4K DI was made of the material, a print of which was shown for comparison last November at a program called "As Good As It Gets." I missed that program but got to see the 70mm print off the original negative at a private screening at the Egyptian Theater. I had not seen new 65mm material since the Super Dimension 70 demos, and though not at 48 fps, this looked TERRIFIC!!! The detail you could see was breathtaking. Little grain was visible, and I was sitting in the seventh row. I forgot to ask if Digital Projection, even 4K, could stand up to that; some who saw the "As Good..." show, where a digital version was also shown, said that it couldn't. Mr. Bennett, who was at the screening, said that after the November program, there was a run on available 65mm cameras, as filmmakers were electing to shoot their big masters in 65mm (as was done for THE NEW WORLD), and closer angles in 35mm, usually Super 35, matching up the material in the DI. Could this lead to a new feature shot in 65mm? Maybe. Though the results of the survey of American 70mm equipped theaters done by New Line Cinema a couple of years ago were apparently never published, an independent survey done by fromscripttodvd.com concluded that there were still enough theaters from the Eighties to support a reasonable American 70mm release, though they aren't all the kind of venues we like to see 70mm in, and they'd all have to install DTS readers, magnetic striping apparently no longer being available, which is a print cost saving. I didn't have time to check in70mm.com to see what the situation is in Europe, but was surprised to hear that there are no 70mm screening facilities in Germany, so the people at Arri, who do have the world's only 65mm laser scanner, have never seen this print! 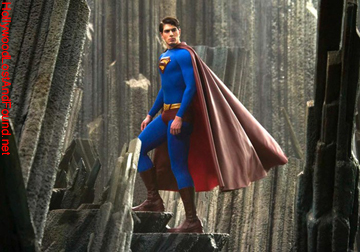 Unfortunately, the situation with SUPERMAN RETURNS is likely to be used against any filmmaker lobbying to shoot totally in 65mm. In an American Cinematographer article, cinematographer Newton Thomas Sigel, ASC stated that after testing 65mm and being enthusiastic about the results, they elected to go with digitally shot Super 35 because the film's total release could not be in 70mm. Mr. Sigel apparently didn't do his research, or he would have known that at the height of the Eighties blowup craze, no more than 200 70mm prints were ever made, and during the roadshow era, rarely as many as fifty! But the 35mm prints, and even 16mm anamorphic, and in one instance that I know of personally, Super 8 anamorphic prints of those films are of higher quality than from 35mm photography, especially Super 35. The examples I'm citing were all photochemical reductions; I don't know what the results would be from a DI. This 70mm print was screened in Bradford, England in March, and the "As Good As It Gets" Program is to be repeated in Los Angeles prior to Cinegear. At this time, 35mm prints from a DI from a new higher resolution laser scan and a digital version will also be shown. At the moment I can't provide additional information, but will pass on any updates I hear to those who are interested. If only someone could get Clint Eastwood to that screening.